Description: Three-eyed, moon-crested, Goddess of creation, dissolution and recreation; the only World-Mother; Source of the Vedas; She Whose substance is the fifty letters of the Sanskrit writing system; She Whose substance is existence and intelligence; Source of knowledge; Abode of bliss; Giver of happiness; Origin of all prosperity; Purveyor of the infinity of forms and desires which attract and distract humanity; Wielder of the terror-causing-power (that is -- death); She Who silently carries out the relentless process of perpetual decay; She Whose supreme form none know. See also the Goddess Anthology under Bhairavi. To Whom are sacred: rudraksa seeds; saffron (with which Her body shines); the cresent moon; the colour red (Her body is painted vermillion, Her garments are scarlet); the mudras of granting boons and dispelling fear; book (= knowledge); rosary of rudraksa seeds; necklace of large pearls; jar of nectar; the Sanskrit writing system (the letters of which stand for functions and qualities of being); the moon (in which form She creates the world); the sun (in which form She maintains the world); Fire (in which form She destroys the universe). Male associate: consort, Bhairava (who is Siva when he assumes the form of the all-pervading ruler of death). The fifth, (or sixth) transformation of the Mahavidyas, qv Mahavidya. Terrible aspect of: Parvati, qv Uma. Also called: Sarasvati, She-Who-Flows-Eloquently-Onward, qv. Sources: Stutley HDH 41; Woodroffe HGHK 23-30. Description: Goddess of the Triple City; She Who emerged from the lingam which then divided into three parts; She Who silently carries out Death's relentless work. Male associate: Siva, when he assumes the form of the all-pervading ruler of death. This is a title of Bhairavi, The-Terrible. A form of Gauri, qv, is called Tripura, The-Triple-City. Tripura is also called: Mahamaya, qv Urmya. Description: Goddess of the Triple City; Fairest Being in the three spheres, heaven, earth and air. She is a form of Durga, Inacessible-One. 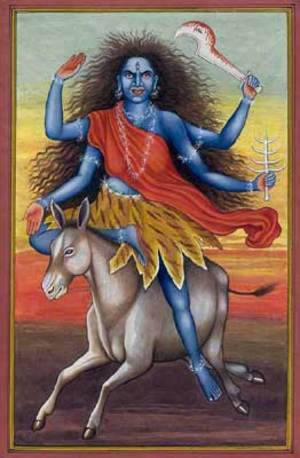 She is one of the six varieties of Gauris, Who are linked under Gauri. See also Tripura, The-Triple-City, above. Sodasi, Maiden-of-Sixteen, (Who is linked with Mahavidya, She-of-Great-Knowledge), is identified with Tripurasundari, Fair-One-of-the-Triple-City. Tripurasundari, is also called TripurasundariSundari, Fair-One. worked on: September, May 1995; August 1991; July 1990.